There are about 450 graduate assistants currently teaching on campus. Learning to balance their student and assistant responsibilities helps them prepare for post-graduation. Ranjit Koodali, the dean of graduate education, said there are four types of GAs. Koodali said the biggest benefit students receive from being a graduate assistant is the stipend. The minimum stipend set by SDBOR in this fiscal year is $3,763 per semester, but some grants allow for students to receive higher stipends, Koodali said. Another benefit of being a graduate assistant, Koodali said, is the reduced tuition. They still have to pay the full fees, however. “If one is a resident of South Dakota, you pay 53 percent of the resident tuition fees, if one is a non-resident, you pay 63 percent of the resident tuition fees,” Koodali said. Koodali said graduate assistants also have the benefit of getting hands-on teaching experience, conducting research with faculty and learning new knowledge or skills in their disciplines. “So collectively, the stipend, the reduced tuition and that work experience be it in a teaching setting, research, clinical or administrative setting, are the three benefits that I think graduate students have during their studies,” he said. Magen Chan, a first-year graduate student IOR, is studying communication studies. She said in addition to the tuition reduction and stipend, she’s enjoyed the teaching experience. “It’s great, of course, since I’m an international student, I think teaching speech classes will help my communication skills especially,” Chan said. Chan teaches two Speech 101 courses. 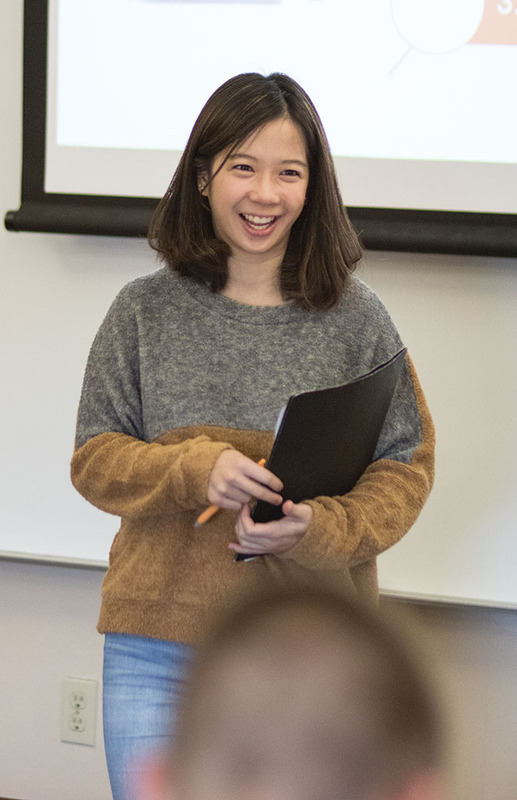 “I’m learning a lot because speech 101 is a really basic course that we took in freshman (year)… so it’s like refreshing memories and communication skills for sure,” Chan said. The first type is graduate teaching assistants, GTAs. Koodali said there are roughly 50 of them across multiple departments on campus. A subclass of those are the graduate teaching assistants who are called instructors of record, IORs. Koodali said they’re given full freedom to develop a course under the mentorship of faculty. The next type of assistants are graduate clinical assistants. Koodali said the two largest groups of assistants are the graduate research assistants, GRAs, and the graduate administrative assistants, GAAs. Islam works for USD’s Information Technology Services, ITS. Chan said she uses her office hours as much as possible to help balance her schedule. Cheyenne Marco, an IOR, is in the fourth year of her Ph.D. program and studying English with an emphasis in creative writing. Islam said having the discipline to manage his time as a graduate assistant will help him in the future. Islam will finish school this December and his goal is to work for IT in big companies. “I mean, you always find a way or always find a good schedule so you can manage it or you can use your time as best you can because you have to study or you have to work,” Islam said. Marco, who’s graduating in May of 2019, said she plans to continue teaching. Chan said she’s not sure what she wants to do after graduation yet. Marco said the graduate program does a lot to instill responsibility in graduate students.